Don't Miss Out On The Best Breeding Deal in the Country!! All Around Horses in The Buckskin Industry Today! We have retained Undun Wind's same breeding fee for many years! This year is no exception. Breed to the best known producer of WINNING all around horses in the buckskin industry and you won't have to mortgage your farm to do it! Email us if you have any questions. Also check for breeding specials on the home page. We are willing to take payments for breeding fees to do our part to assist people during these tough economic times! The entire fee must be paid before the breeding takes place. Plan now for 2012 and get an early booking discount too! See the Home Page for details! We are willing to work with our mare owners from the first inquiry, through the breeding & foaling and throughout the life of that new foal! Undun Wind foal as you are! 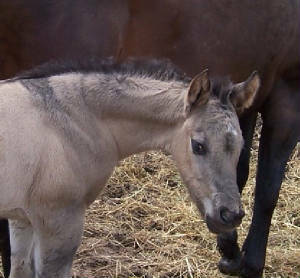 Want a Foal Like This?? 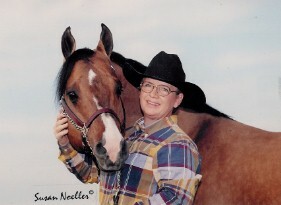 We will continue this program of donating a portion of Undun Wind's breeding fee to charity in 2012. Please help us do our part to help America by breeding your good mare to one of the most prolific Buckskin registered stallions in America today! "Over the years I've seen over 100,000 horses of all breeds, all disciplines and it is interesting how just a few have that "look at me" appearance, manner or attitude. Clearly, Undun Wind is one of these horses. As soon as I saw him in his stall at Equitana USA 2001 I knew immediately that he was a horse that I could really promote." Undun Wind was a huge hit at The Eastern Equine Affaire in Massachusetts. Thousands of visitors stopped by our stalls; watched him as he was presented to the crowds; signed breeding contracts; and took info on his get for sale! 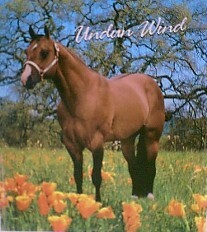 Undun Wind has been shown very successfully on the Quarter Horse, Foundation Quarter Horse and the Buckskin Circuits for several seasons. 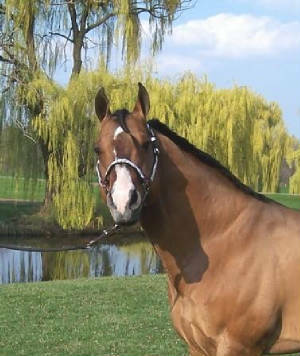 If you are looking for a stallion to breed to who has a calm, easy going disposition, Undun Wind is your guy! At Midwest Horse Fair, our 2 year old grandson Reese insisted on 'riding' Undun Wind. 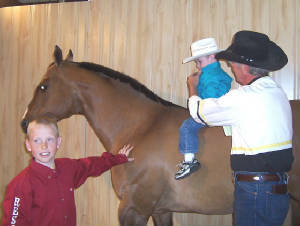 His ten year brother Jonny is helping Grandpa Bob in Undun Wind's stall! This is the kind of disposition you can look for in an Undun Wind foal!